I've been to Berlin a few times now both for school trips and for pleasure. It remains one of my favorite cities that I've thus far visited, and I'd love to live there some day. The atmosphere is one of contrast between old and new, past and present, clean and rough. There's always something going on. Its unique history post-WWII has allowed Berlin to reinvent itself in ways uncommon to other cites that are overwhelmed by their image. It has become a hotspot for the young, for artists, for immigrants, for foodies, for politicians, and for techies alike. Because of its attraction to so many international peoples, Berlin offers more culture and cuisine than many other German cities we've been to. And despite it being the nation's capital (or because of it), English tends to be a more common lingua franca, making the city very easy for English-speaking tourists. My recommendations are by no means complete, and I intend to add more posts as we visit the city again in the future. However, the following represents my suggestions thus far, and I hope you'll find them useful for your first time in (or return to) the city. When Matt and I made our first combined journey to Berlin in the April 2013, we chose to stay near the city center at Hotel Amano. We found the hotel in my Fodor's guide on Germany (copyright 2012) and chose it because they offered us a good rate and location. It turned out to be a good booking. The hotel was clean and modern, and had a very cool neighborhood bar in the lobby. In terms of location, Hotel Amano was just two blocks from Rosenthaler Platz, making it very easy to get to by subway. Best of all, it was also within walking distance of some really cool areas, like Hackescher Mart and with Museum Island just beyond. Tip: Even in April, it was still snowing in Berlin. (As an American, I have to remember that Germany is on the same latitude as Canada.) Be sure to check the weather and bring some super warm sweaters, boots, and long, padded coat if you're going in the winter months. I swear the wind blows in from the Russian tundra, or at least that's what it feels like when the temperature drops. I also carried around foot and hand warmers for the especially chilly nights. Unlike some smaller cities like Stuttgart, Berlin has more than one "center". It's more like a number of smaller cities or neighborhoods cobbled together, each with its own character and feel, like Tokyo, New York City, and even Amsterdam. The transportation, as such, is excellent. We took the train to Berlin with DB from Stuttgart. It was a very pleasant five-hour trip (up to six hours depending on if you have to transfer trains) and was cheaper for us than flying. I also tend to like the low hassle with train journeys. You can get up and move around, have a nice sit-down meal in the dining car, keep your electronic devices on at all times, and keep your luggage with you. Plus, when you add up time spent on getting to the airport, checking in, going through security, waiting for the flight, flying, and getting to your hotel, then it ends up being about five or so hours anyway. Berlin has an extensive bus, subway, and train system connecting all the outer areas. When we first arrived, we went to the local tourist office and purchased a three-day Berlin WelcomeCard for unlimited travel in the AB zones of the city and with discounts to many of the major museums and sights. We used the BVG FahrInfo Plus Berlin app to help us get from point A to B on the metro line. You simply enter in your location and destination, and the app tells you exactly where to go and how long it will take, and it even allows you to purchase tickets. That said, Berlin is relatively flat, and so it's pretty easy to walk if you have the stamina. Hackescher Markt - This was such a cool area of the city to walk around in. You can either walk here or get off at the subway station of the same name, which is a lovely brick building. We saw tons of really interesting graffiti on side streets, fun shops (like the Muji store! ), and delicious restaurants. 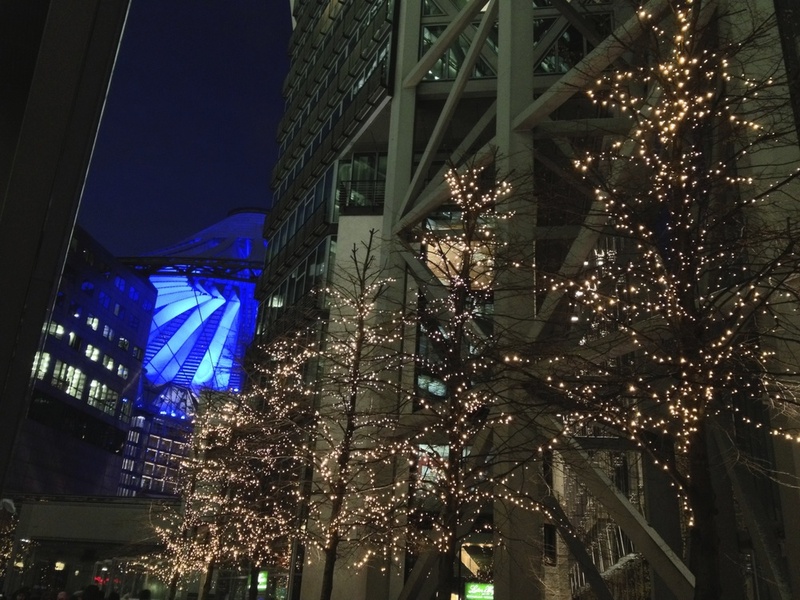 Potsdamer Platz - This square, which was totally leveled during World War II, shines because of the large buildings and flashy new Sony Center with a roof that resembles Mt. Fuji. You can also see a replica of the first traffic light in Europe, which was built here in 1924. The Berlin International Film Festival is also held here every year at one of the large cinemas. There's a permanent Dalí Exhibit there, which had several of his lesser known drawings, sculptures, and even animations, and which I rather enjoyed. Brandenburger Tor - Of course you have to see the Brandenburg Gate while in Berlin. It's an impressive monument with an interesting history. It sits in the middle of Pariser Platz, which got its name as a kind of slap in the face to the French after the Germans recaptured the Quadriga on top when Napoleon was defeated in 1814. You'll also find Hotel Adlon in the square, which was one of the most famous hotels in Europe prior to the fire that destroyed it during the Russian occupation of Berlin during World War II. You might also remember seeing it on the news as the place where the late Michael Jackson dangled his son Blanket out the window in 2002. Unter den Linden - This wide thoroughfare used to be lined with more linden trees before they were destroyed or cut down for fire wood during World War II. Now it's mostly lined with shops and restaurants, ranging from the kitschy souvenir shops and Starbucks by the Brandenburg Gate to more expensive, designer stores further down. You can walk the street from Pariser Platz across Museum Island to Alexanderplatz, which is a really cool area with lots of shops and restaurants next to the iconic East Berlin Fernsehturm (TV tower). Along the way, you can admire the lovely buildings of Humbolt Univeristy, one of Berlin's oldest universities, as well as have a look at the memorial to the Nazi book burning in 1933 at Bebelplatz. Just one block from there at Gendarmenmarkt you can stop and see the Konzerthaus, Neue Kirche, and the Französiche Friedrichstadtkirche. If you pay to go up the tower, you'll be rewarded with a lovely view of the city. Reichstag - Definitely go check out the Reichstag building, which is the seat of Germany's parliament. The dome was destroyed in a 1933 fire that Hitler used as an excuse to increase security in Germany and take away civilian rights. It was restored after reunification, and today you can go inside the dome with a guided audio tour that tells you a bit about the city's history as you look out across the Berlin cityscape. Tip: Register for a visit to the building in advance (think weeks). Tours fill up fast, and you won't get in without a time slot. You'll need your passport both to register and on the day of your visit. Tiergarten - Beginning at Pariser Platz, the Tiergarten (meaning "animal garden", the old hunting grounds of the German aristocracy) covers about two square miles of green. It makes for a lovely "country" walk within the city, but there's also tons to see there as well. The Soviet Memorial that was built by the Russians after World War II has two soviet tanks that are presumably the first two in the city during the Russian invasion. The new Memorial to the Sinti and Roma Victims of National Socialism is also located in the park, and has a very sobering, reflective design. Memorial to the Murdered Jews of Europe - Perhaps one of Berlin's most iconic memorials, the Memorial to the Murdered Jews of Europe contains some 2,711 concrete slabs, each with its own height and angle. The memorial is designed so that as you walk toward the center, the slabs get higher. It's very easy to get separated from your friends, and the center is eerily quite, which gives one the impression of being alone. I found it to be a very somber experience. One interpretation is that it's reflective of what it was like to live through Nazi Germany: you begin with your friends and everything is all right, but as you continue, you become lost, separated and alone, until you can regain your footing and come out on the other end, changed. Tip: If you go through the memorial with young children, keep a firm hold of them. For older children and teenagers, it might be necessary to prep them for the experience. (Some of our less mature students thought it would be an appropriate place to scare some of their friends around the dark corners.) Decide on a meeting place before you enter in case you get separated (though do try to get separated if you're with adults, as the experience is more powerful alone), and know that there are memorial employees around during the day to help you if you get lost. I'm not a local, but I wouldn't recommend walking through the memorial after dark. The Berlin Wall - Since the Berlin Wall came down in 1989, you can see bits and pieces of it around the city. I rather enjoyed the World War II walking tour that we took with our students around the city, as we went from the Memorial to the Murdered Jews of Europe, through the fascinating exhibition at the Topography of Terror at the site of the old SS and Gestapo headquarters, to the Berlin Wall exhibition at Bernauer Straße via the old subway station that was sealed off when the wall came up in 1961. The exhibition has preserved a strip of "no man's land" so you can see what the border fortifications looked like. There are also several checkpoints along the way where you can learn about people who died trying to cross the wall, as well as a museum with a couple of videos (also in English) on the wall's fortifications and escape attempts. I haven't been myself, but my husband had a chance to visit the East Side Gallery on Mühlenstraße and which he recommends. It contains many sections of the wall with paintings from hundreds of artists completed after the wall fell in 1990. Museum Island - This island on the Spree river contains many of Berlin's world-class museums. In particular, I recommend the Pergamon Museum, which was built to house the massive Pergamon Altar with its impressive frieze showing various battles of the Greek gods. You can also find the intense blue Ishtar Gate of Babylon and a model of the Processional Way as it would have appeared in the 6th century BC. We also had a look at the bust of Nefertiti in the Neues Museum, which houses several other interesting Egyptian artifacts. Finally, definitely have a look inside the Berliner Dom (Berlin Cathedral), which has a stunning interior reminiscent of The Vatican in Rome. DDR Museum - There are a lot of kitschy museums in Berlin, but this one stands out as a particularly good one that exhibits the daily life of an East Berliner before the wall fell. What makes it so cool is that it's hands-on, so you can see and touch clothing, furniture, and other artifacts from the era as you learn about the restrictions and allowances of the DDR. This is a great museum for kids. Other Museums - Some of the other museums that we visited included Madame Tussauds, The Story of Berlin, and the Checkpoint Charlie Museum. I generally find wax museums creepy but interesting, though I'm not sure I'd pay again for a Madame Tussauds experience. It's a bit pricy, and while celebrities are one thing, seeing Sophie Scholl, Anne Frank, and Adolf Hitler in wax was somewhat unnerving. Don't put the Story of Berlin at the top of your list, but go if you have time to kill. There's a lot of information to take in, so don't bother reading everything about the pre-1900s Berlin. You'll want to save some time for the 20th century, as the 1933 book burning and Kristallnacht parts of the exhibit are well done. And as for Checkpoint Charlie, I only mention it to tell you to definitely go there to see it, but don't bother with the museum unless reading long passages of text on a wall is your thing. I found this one to be overwhelming as an adult, and I saw tons of teenagers blowing off the whole experience because it just was not terribly well-designed. Schloss Charlottenburg - To the west of the main city center in the Charlottenburg area is the Charlottenburg Palace. It was the summer palace of Queen Sophie Charlotte at the turn of the 18th century. While the palace was badly damaged during World War II, many of the rooms have since been reconstructed. It reminded me a lot of a smaller version of the palace in Ludwigsburg near Stuttgart, though the latter is better preserved. If you've never visited a European palace, then do go for one of their tours with an English guide. 12 Apostel - Every year we take our students to the location in the Mitte for the fantastic (and affordable) stone-oven pizza, though I've been twice more on my own because the pizza is just that good. Each of their pizzas is named after the twelve apostles, and I've tasted and enjoyed the Pizza Matteo (cheese and basil), Pizza Tommaso (red onions, peppers, zucchini and pesto), and Pizza Paolo (mushrooms, Italian ham, and arugula). However, the Pizza Judas (salami, peppers, and chillies) is by far my favorite. Matt and I have also had their antipasto appetizer, but just know that it is rather large. Matt and I could not finish the appetizer platter and a pizza each (which is the size of perhaps an American small pizza and could easily feed two people). You should also go because the restaurant with its beautiful painted ceiling is located under an old subway bridge, so you can hear the subway rumble by as you eat. If you look closely on your way in, you'll see lots of patched up bullet holes from the war. When you're finished eating, there are many more restaurants and bars along Georgenstraße for an after dinner drink. Die Deponie Nr. 3 - If you're looking for more traditional fare or even just for a drink, then check out this cool pub along Georgenstraße. I've been here for beers and cider a few times, though I ate here on one occasion and the food was pretty solid as well. I had the Hausgemachte Riesenkohlroulade, and I've since learned that riesen means "giant". The dish is a kind of meatloaf wrapped in bacon and rolled in cabbage leaves, then smothered in gravy and served with potatoes. It was a great, hearty dish for my winter visit, though I'll be sure to be really hungry the next time I order something with riesen in the name. Yumcha Heroes - This could possibly be my current favorite restaurant in Berlin. As a disclaimer, part of it is because I've found it a challenge to find good Chinese food in Stuttgart and part of it is because I love dumplings, and Yumcha Heroes' menu is just about entirely filled with dumplings. I particularly like the chicken dumplings (chicken, thai basil, ginger, and chili), the orange prawn dumplings (prawns, water chestnuts, Szechuan pepper, egg, and bamboo), Ja Zhi dumplings (duck, chestnuts, and figs), and the Shanghai dumplings (minced pork, Szechuan pepper, ginger, and hot broth). The dumplings come either steamed or fried, per your preference. They also have a number of other dishes including dumpling soups, salads, rolls, and sticky rice in a lotus leaf. I also enjoyed the steamed silk tofu and the steamed bok choi on another visit with a coworker. To drink, try one of the fresh juices (my apple, cucumber, ginger juice was outstanding) or one of their hot tea flowers that bloom in your glass. Curry 36 - Although Matt and I had already both had currywurst (a grilled sausage smothered in curry-flavored ketchup) before, we decided that we couldn't visit Berlin without trying the iconic dish. We chose Curry 36 because it was recommended in my Fodor's guide to Berlin as being popular with locals. The "restaurant" is more of a food stand, and the line was already quite long when we showed up shortly before peak lunch hours. We ordered our currywurst with fries rot-weiss (literally "red-white" or ith both ketchup and mayonnaise), and both thought it was the best currywurst that we've yet had in Germany. Zur Letzten Instanz - Another recommendation from my Fodor's guide, this restaurant (meaning "at the eleventh hour") dating from 1621 is said to be the oldest in Berlin. You can believe it, too, as you walk through some Medieval-looking streets which almost seem out of place with the bombed-out rest of the city. Napoleon is even said to have dined here. Matt and I weren't the only tourists in the restaurant, but it didn't feel "touristy" in the sense that the menu and ambience were still very traditionally German and the food clearly homemade. In particular, oth of us were delighted to see not butter, but lard with cracklings served with our bread at the table. Matt enjoyed the tender pork knuckle with sweet red cabbage and a fluffy potato dumpling, while I had a succulent lamb special on the spring menu. Sadly, I didn't get any pictures of our delicious meal. Chopstix - My coworker and I stumbled upon this kaiten-zushi (conveyer belt sushi) place just off of Alexanderplatz and decided to give it a try. They offered a 15,95€ all-you-can-eat menu for dinner, and given the higher quality of the sushi, we were rather impressed. The fish was way fresher than most of what we get in Stuttgart, and they had some really delicious rolls on the menu, like a warm, crunchy fried salmon roll with fresh cucumber. I also liked that you could pick up dessert (sweet honey fried bananas), too. The restaurant was still new when I visited earlier this year, so I'd like to go back and try them again once they've settled in. Die Henne - Die Henne felt like an odd choice for our first time in Berlin, because although the restaurant has been around for over a hundred years and survived two world wars, their specialty is fried chicken. I mean, all they serve is fried chicken, and that just seemed almost sacrilege after coming from the Southern U.S., which I've always considered the home of fried chicken. Perhaps because we missed real fried chicken so much, we decided to try Die Henne, and (it feels even more sacrileges to say this) I think we ate the best fried chicken we've ever had there. The restaurant was pretty packed when we got there on a weeknight, but two men (who sounded like expats) were kind enough to offer us their table since they'd just finished their beers. We each got a half of a chicken with our order, in addition to a side of coleslaw. Our fried chicken took a while (which they say is because each bird is prepared fresh), and when it came out, I was shocked by how perfectly crispy and golden the outside looked. I could hear an audible crunch as we took our first bite, and I even slurped a little to gather up the juices in my mouth that were seeping from the meat. The taste really was heavenly for an expat Southener. Like I've said, this list is in no way complete. Berlin is a huge city, and I'm afraid we haven't given it as much of a food tour as we could. Do you have any recommendations for Berlin? Please leave them in the comments below and I'll be sure to try them on my next trip!